Cleanse and refine your complexion with the Dr. Hauschka Cleansing Cream. The edition comes with a free eye makeup remover to leave eyes feeling cleansed and refreshed. Working to cleanse, exfoliate and protect your complexion, the cream cleanser eliminates impurities and absorbs excess oil without over-drying or uncomfortable tightness. Suitable for all skin conditions, the cleanser is infused with Calendula, Chamomile and Sweet Almond to support the natural barrier function and maintain moisture levels. Free from synthetic fragrances, dyes, preservatives, mineral oils, silicone and PEG. Vegan. 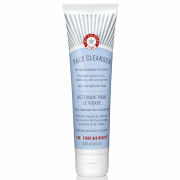 Cleanser: Moisten face and neck with warm water. Mix 1-2cm with water in the palms to form a smooth, creamy paste. Press gently into the skin with a rolling motion, starting in the centre of the forehead then slowly working outward and down. Rinse with plenty of warm water. Cleanser: Water (Aqua), Prunus Amygdalus Dulcis (Sweet Almond) Seed Meal, Calendula Officinalis Flower Extract, Anthyllis Vulneraria Extract, Alcohol, Arachis Hypogaea (Peanut) Oil, Chamomilla Recutita (Matricaria) Flower Extract, Hypericum Perforatum Flower/Leaf Extract, Helianthus Annuus (Sunflower) Seed Oil, Hamamelis Virginiana (Witch Hazel) Bark/Leaf Extract, Triticum Vulgare (Wheat) Germ Oil, Prunus Amygdalus Dulcis (Sweet Almond) Oil, Fragrance (Parfum), Citronellol*, Geraniol*, Malpighia Punicifolia (Acerola) Fruit Extract, Xanthan Gum, Algin.